When you walk into Wes Warren’s office you may notice the Charles Darwin bobble head, or the platypus on the cover of Nature magazine or even the shelf of colorful books in the corner. At every glance, you’ll probably see a picture of a different kind of animal. Animals aren’t just a passion for Warren, they are the target of his research. Over the past 17 years, he has worked with around: 10 mammals, 6 bird species, 10 fish genomes, five different species of Tsetse fly, sand fly, even the common house fly, and that’s just the beginning. Warren deciphers the genetic codes in each species to better understand them and how these blueprints of life give us insight into the genes in humans to help better understand disease prevention. Growing up in Florida with a beef cattle family business, Warren always thought he would be a vet. He went to Oklahoma State University for Animal Sciences in hopes of becoming a large animal vet, until he realized his fascination with research. He then went to Clemson University and got a masters in Reproductive Physiology. For his Ph.D. Warren then came to MU and studied Molecular Endocrinology, again in the Animal Sciences field. And Warren came back here to his alma mater just a couple weeks ago to start his own lab. 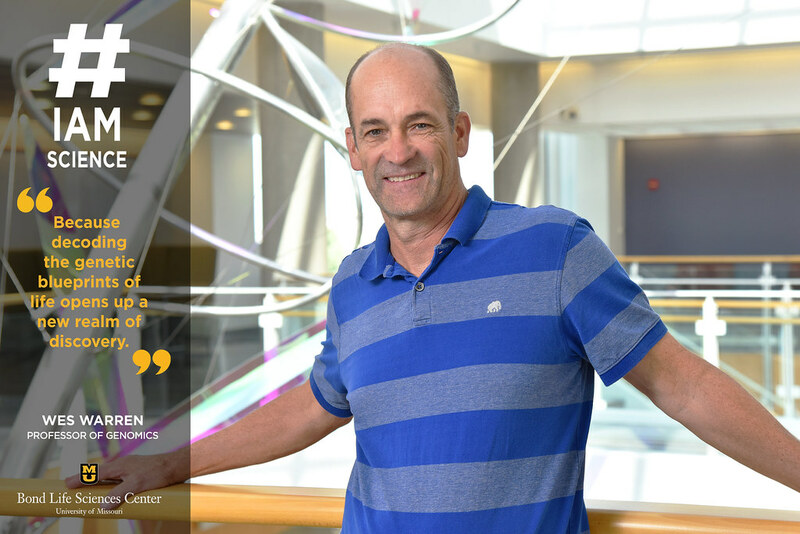 Warren’s lab may not be set up until the end of this year, but he is excited to make advances in his research. Before coming to Bond LSC, Warren spent his first career years at Monsanto and then felt the need to return to Academia. At Monsanto most of his research was in molecular biology. He also continues to collaborate with the St. Louis Zoo on the unknown causes of high incidences of pyometra urinary in African Painted Dogs. Rice ties together much of Bing Yang’s life. From his childhood in China where his father farmed the crop to more than 20 years of research on the staple, it’s more than just food. Originally from Southwestern China, Yang initially went to college at Southwest Forestry College in China and later came to the U.S. for the opportunity to further his education. He studied bacterial blight in rice at Kansas State University and received his Ph.D. in Plant Pathology. He continued this research at Iowa State University where studied genome editing, eventually becoming a professor in Genetics, Development and Cell Biology. He joined MU as a professor of Plant Sciences and joint hire for the Donald Danforth Plant Science Center and Bond LSC. Bacterial blight is a deadly disease that can kill up to 75 percent of a rice crop. While Yang focuses on this pathogen, his research can expand understanding of the molecular mechanisms behind various plant diseases in a number of crops. 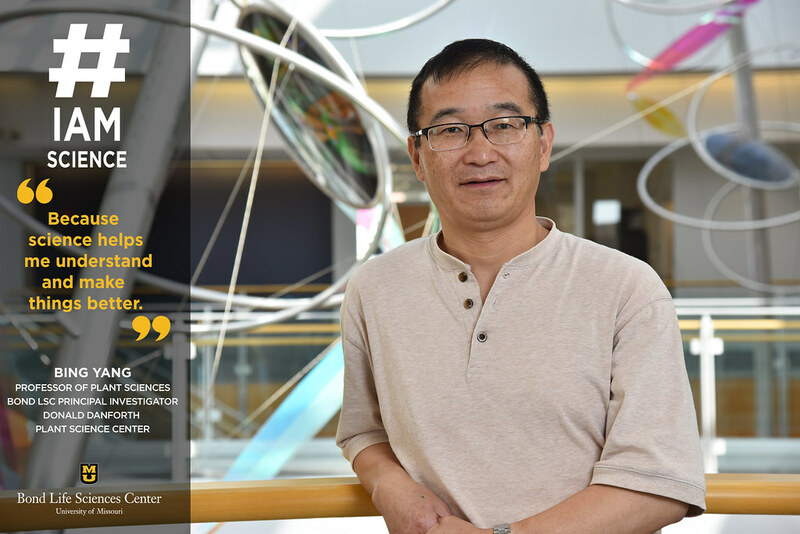 Yang hopes his genome editing paves a way to create a more disease resistant plant. “Especially with the advanced technology we can engineer some crop and rice varieties with better resistance,” Yang said. But this research is more than new discoveries, it’s a part of who Yang is. While his lab area may be bare for now, in a few months’ new advances will come with getting his lab up and running on the third floor of Bond LSC. But failure doesn’t scare Yang. When Brittany Cruzan does her laundry, she can’t stop thinking about science. “Science controls our everyday life,” Cruzan said. “Coffee, tea, the way you cut your hair, it’s all science. I’ve liked science since I was a kid. I am obsessed with knowing how things work. I don’t care why but I care for how. Cruzan applies that desire to know how things work to work in the lab. From her first semester of freshman year to now as a junior, Cruzan been in Mannie Liscum’s lab chasing the how behind the science. The lab uses Arabidopsis as their model plant to study its growth and how the plant responds directionally to light. This research can aid scientist in enhancing plant growth in drought and other circumstances, and they use mutations to explore which genes might create characteristics that are more resilient to stress in the environment. Now that Cruzan has her own project it’s easier for her to realize the potential impact this research has on others. After college Cruzan wants to continue impacting lives. She plans to volunteer before she applies to med school, and she believes life is full of endless possibilities. For now, you can find Cruzan in the lab focused on a way to improve plant growth. Research is like a puzzle, and figuring out how the pieces fit together is Gilberto Perez’s favorite part of research. Before coming to Mizzou, Perez had mindless jobs in high school and that’s why he likes the idea of a puzzle. He came here unsure of what he wanted to be involved in until he was introduced to a major in biochemistry. He took classes with Stefan Sarafianos then soon got involved with his lab at Bond LSC. When Sarafianos left Perez was under the direction Kamlendra Singh in the lab. 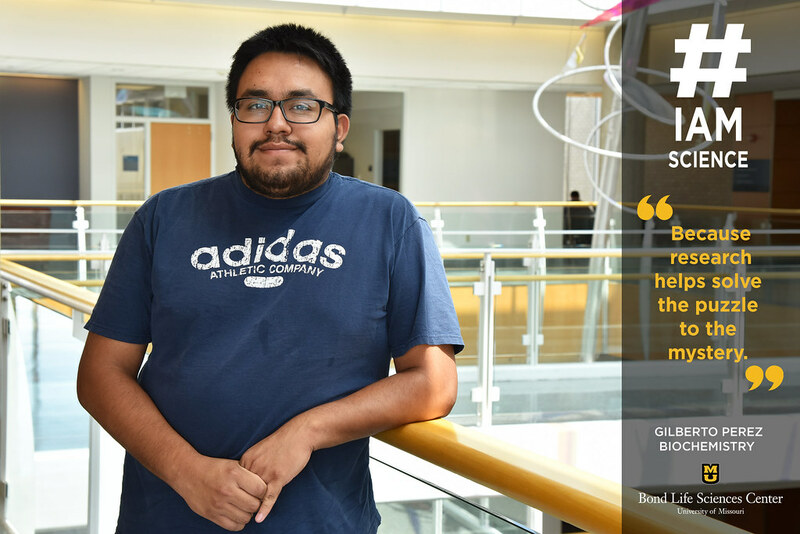 When Perez first joined the lab his sophomore year he made solutions and buffers, now he uses those same buffers to make reaction mixes to see the efficacy in drug resistance in HIV. The lab tests which drugs react best to HIV viruses. Two years later, Perez sees how research extends outside of the lab. Along with a new way of seeing life, the lab has also introduced Perez to different perspectives on various cultures. However, a new perspective isn’t the only thing the lab has given him. Perez was president of Association of Latina America Students last year and credits the lab for the confidence to run. Sometimes there’s a deeper meaning behind why we do the things we do. Whether it be what we study, or research, the meaning is always there. Alex Marx always knew he would go into medicine, but didn’t expect to do research. 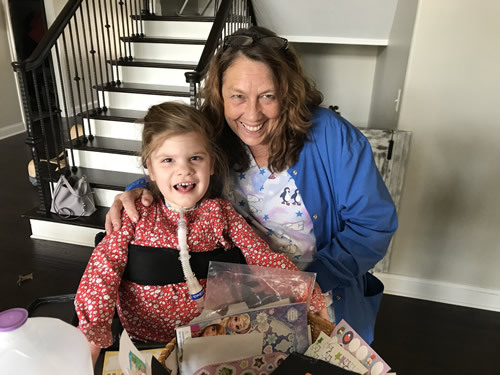 Growing up with two parents who are in health care, and a great grandmother with Alzheimer’s Disease, medicine and certain neurological diseases intrigued Marx. When Marx came to college he became friends with Dr. Setzer, professor in Biological Sciences, who soon introduced him to research and, more specifically, Anand Chandrasekhar’s lab in Bond LSC. Marx started that project in the lab this semester. To Marx, he believes work in research labs could have a greater impact in the world of medicine. 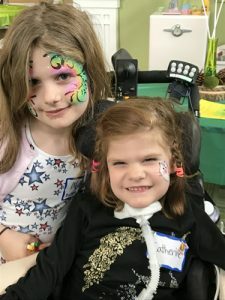 “We focus on how the fish behavior is modified when mutations happen, and there is a possibility that zebrafish could be a molecular model for other animals,” Marx said. “What drew to me to the lab is my fascinations with neuron diseases — my great grandma has Alzheimer’s — and this research helps me understand the brain and could have some implications in medicine. And the brain is what keeps Marx motivated in his research. Marx will bring that motivation with him to med school. Marx credits research for making him the student and person he is today. Chaise Heim wasn’t reluctant in his pursuit of science. In high school, a program called Triple E gave him his first major exposure to his desired career in the form of an internship. That led him to David Emerich’s lab in MU’s biochemistry department where he spent a cumulative 40 hours during the program. Heim has worked in Donald Burke’s lab in Bond LSC since January. Being in the lab for almost nine months has taught Heim different perspectives on science. By shadowing Ph.D. student Nguyen Phuong, Heim is guided through the processes and given research papers to help comprehend the science. The aptamers are used to bind to HIV protein in the reverse transcriptase. 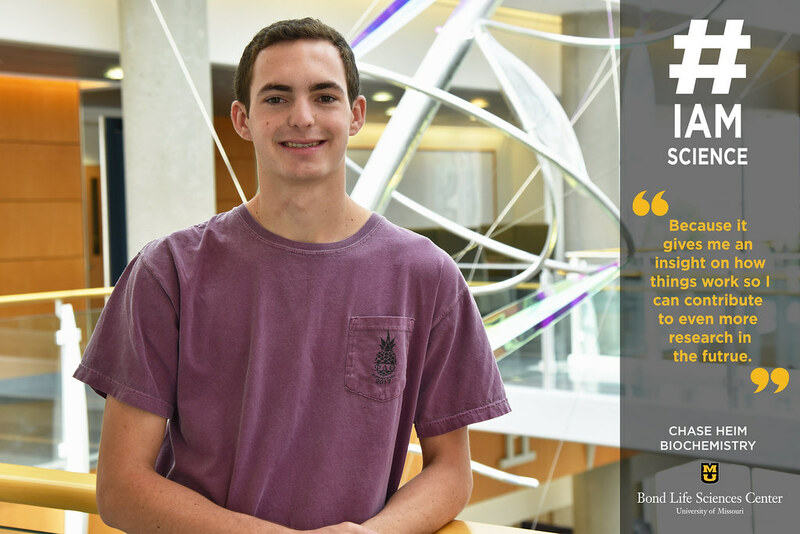 Although Heim is starting his sophomore year, he already plans to guide others through research in the future, much like how he is being guided now. Heim’s involvement includes Deaton Scholars, the Chancellors Leadership Class and being a TA, the Emerging Leaders Program and Phi Delta Theta Fraternity. Heim said the language of science has pushed him to get more involved in research. Being involved in research changes perspective in and out of the lab. Senior Rebecca Craigg came to college thinking science always had an answer. Craigg joined the Cornelison lab freshman year. As a first-generation college student Rebecca was unsure of what was in store for her. But as she grew as a researcher, she also did as a person and started to understand the value of working in a lab. The Cornelison lab researches regeneration and disease in muscles. They study how cells respond to different cell signals in order to rapidly, efficiently, and repeatedly respond to muscle damage or disease. Since freshman year Craigg has studied a specific receptor EphA7, which responds to different factors and is connected to how muscles rebuild. 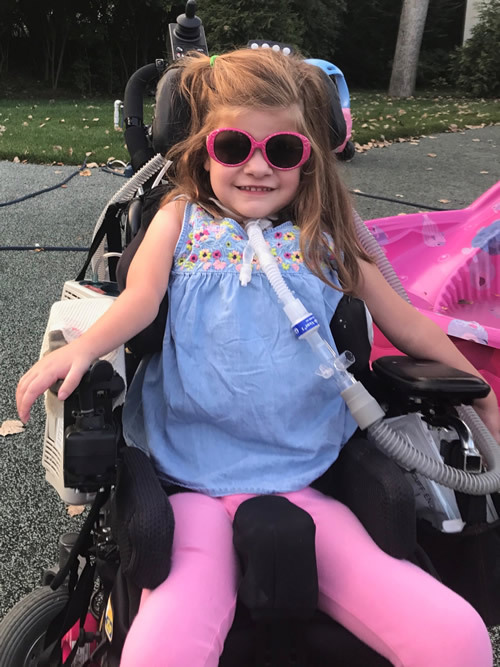 This summer marks the first time Craigg has been in the lab full time, an opportunity she received by being chosen as a Cherng Summer Scholar. 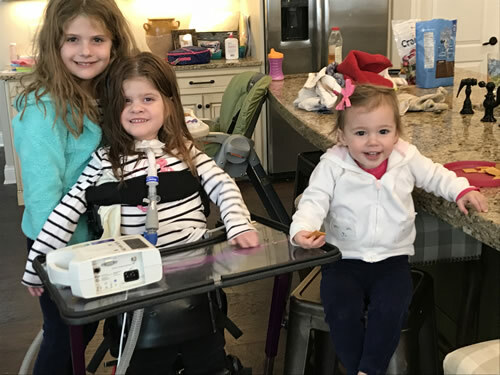 Craigg has put those skills to work on service trips to Honduras and Nicaragua where she helped provide medical and public helth assistance and assisted with water engineering, respectively. These trips shaped her perspective on the importance of science and its lasting impacts. And that’s why Craigg’s dream is to be involved with Doctors Without Borders. She wishes to create a lasting impact on the community she serves. Craigg volunteer work also has an impact closer to home. Sophomore year Craigg started a service organization called University of Missouri Student Organization for Human and Animal Interaction, the organization volunteers at animal shelters through the Research Center for Human Animal Interaction. The club helps with research. College is a time of finding yourself and finding what you actually want to do. For senior Skyler Kramer, he knew his first year of college. 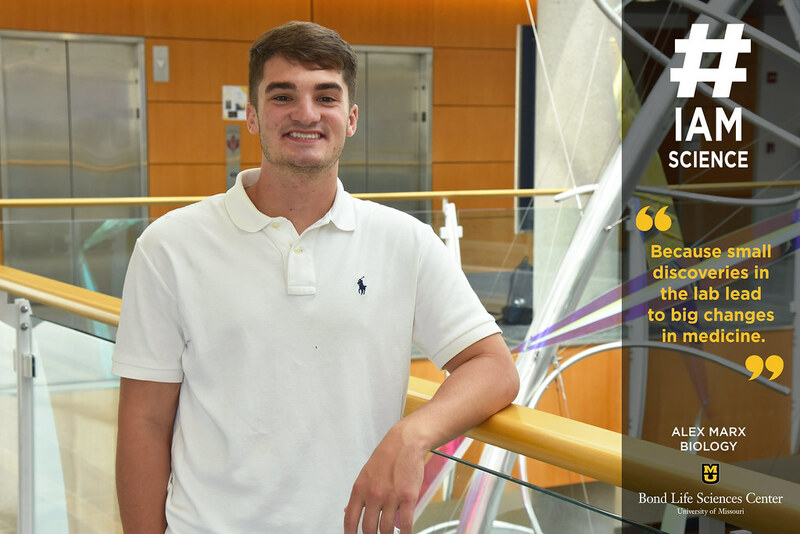 Kramer currently works in the the Sumner Lab as a summer intern, however, this is the fourth lab he has worked in since coming to MU. Kramer started out college in a biology lab studying conservation in Tucker Hall his freshman year. His research experience soon made him forget his childhood dream of being a doctor. He realized he enjoyed working on the body, but from a research perspective. And that is what launched him into the world of research. 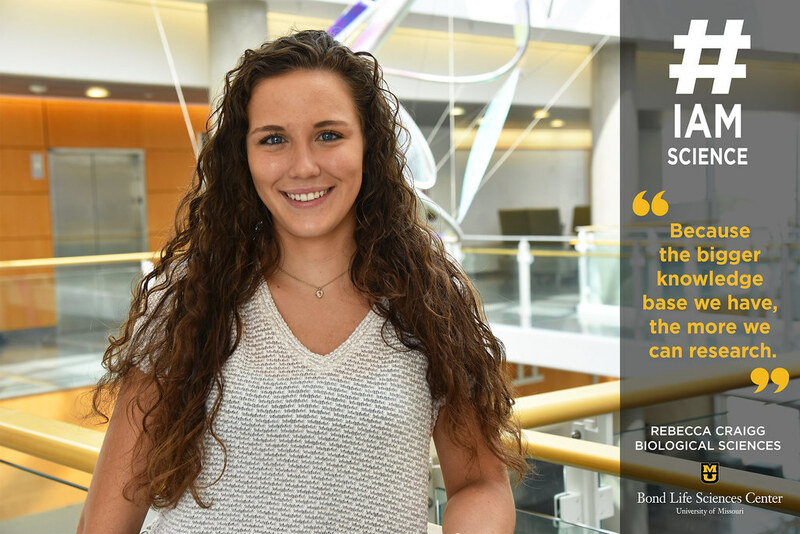 Sophomore year Kramer joined Stefan Sarafianos and Kamal Singh studying HIV and moved to the McSteen Lab to study corn junior year. Now as a senior he continues his niche for research and has added two minors — statistics and computer science — to help understand different types of research better. In the Sumner Lab, Kramer has looks at research from a computational vantage point. Kramer is working with instruments learning to predict variables for plant natural products and metabolomics. Kramer has a training set he has made and is using it to predict other data sets. Even with Kramer’s current research, he still finds virology something he is interested in. 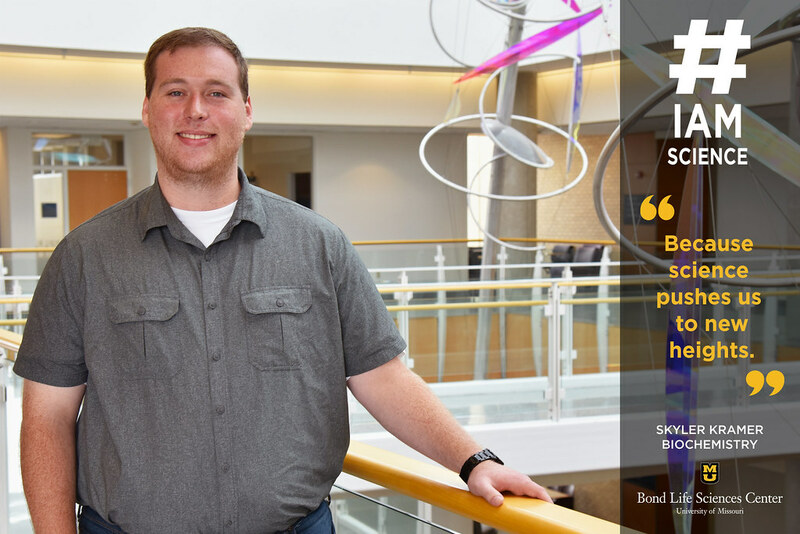 Working in the Sarafianos lab gave him motivation to go to graduate school and continue research in that area. 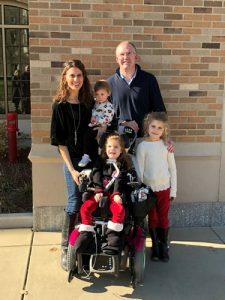 When it comes to proper health care and medicines, Kramer’s extracurricular activates run parallel with his research. He is vice president of Relief for Africa which is a non-profit student organization that raises money to travel overseas to help the current public health situation in Africa. As if Kramer doesn’t have enough science in his daily schedule, he is treasurer for the chemistry fraternity, co-president of the biochemistry club, in the biochemistry mentoring program and a chemistry/biochemistry tutor for The Learning Center. However, he wouldn’t have it any other way. “I think science important to life because you always to keep moving and learn things around you,” Kramer said. Being the youngest person in the lab has opened the eyes of this English, German and Croatian speaking undergrad. 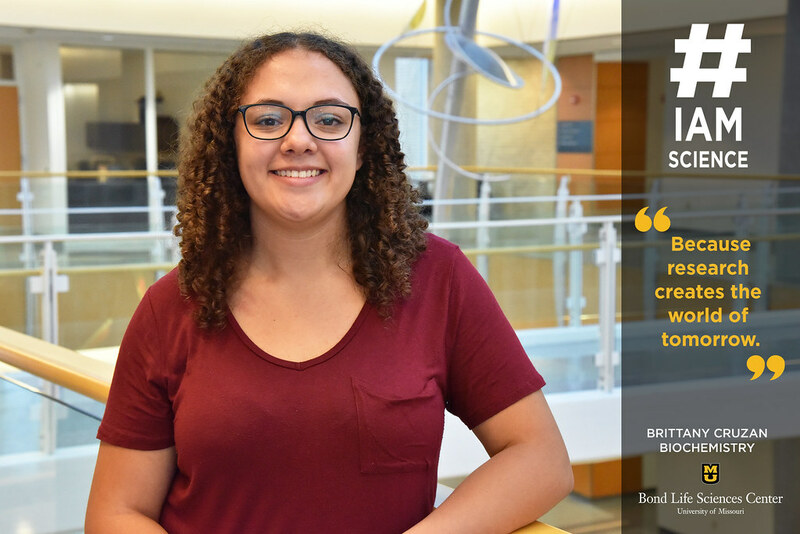 Research was not always on senior Gabriela Akrap’s mind, until Ruthie Angelovici told her to apply for REU (Research Experience for undergrads). Being accepted started two months in Angelovici’s lab this summer that expanded Akrap’s science experience. Akrap first was intimidated at first since she was younger that others in the lab, but soon came to feel comfortable. Akrap currently studies Biology and German, but is still exploring what she wants to do in the future. 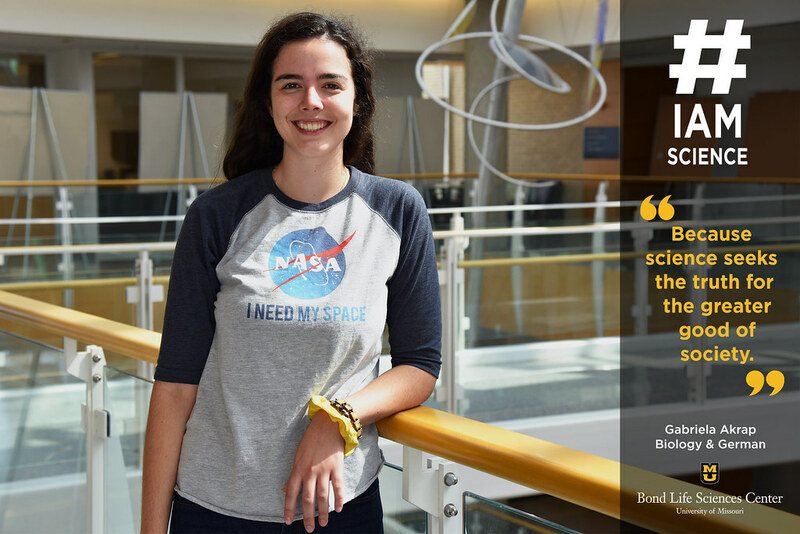 Being in the lab has given her a new perspective on a possible science career. Akrap will either pursue med school or graduate school, a choice yet to be made. Akrap has always wanted to be a pediatrician. The research Akrap does plays into her desire to help others. She is currently studying the amino acid composition in seeds. The goal is to understand the genetic regulation of these amino acids composition in the seed. Akrap wishes to solve the energy crisis as well as the food crisis. From asking her mom ‘a bajillion questions’ growing up to now, Akrap’s fire for science has been maintained through moments in the lab.